We sell Palm Heart produced in Brazil. Available in 300g glass pots. heart, palmito, chonta or swamp cabbage, is a vegetable harvested from the inner core and growing bud of certain palm trees. 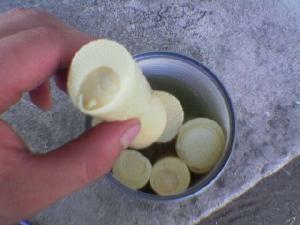 Heart of palm is often eaten in a salad, sometimes called "millionaire's salad, " and also in vegetarian spreads.